JSL started nursery school in September. I braced myself for illnesses to keep him home from school. When NHL started daycare, he was sick all the time. It appears that having a big brother has helped to exposed JSL a lot. Sure, he has had a cold here and there, but nothing too exciting. Today, he is home from school for the first time. Sunday night he was coughing horribly. TechyDad and I were very worried and eventually did a nebulizer treatment that helped some. I decided to take JSL to get the cough checked since it had intensified over a 2-3 week span. It also allowed me to have his ears checked for any fluid concerns. We went to the doctor and everything checked out. No fluid in his ears, glads were not swollen, and lungs perfectly clear. Since the cough has been hanging on antibiotic was given before starting more aggressive asthma therapy. We left, picked up the medicine at Target. When TechyDad got home from work JSL refused to eat dinner. He was curled up on the couch coughing horribly. We decided to do a nebulizer treatment to see if it would ease things up. A short time later he started coughing so hard he got sick and was vomiting. Then he complained that his head hurt. RED ALERT! Why you ask? 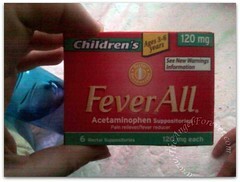 Well, JSL often shows no signs of a fever when his temperature is spiking. Febrile seizures are often our first clue. The last few times he was sick he complained that his head hurt. Sure enough, that was how we checked and saw he had a fever. 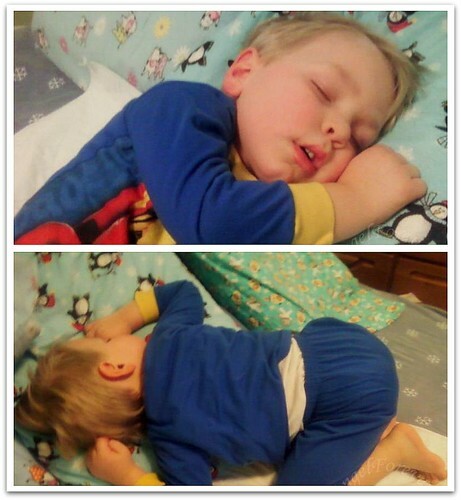 JSL’s temperature was going up, so we gave him Ibuprofen and he settled in to sleep on my bed. All was good until 9:00. JSL woke up coughing terribly. You could see his chest caving in as he made horrible sounds. Steam, cold, and other tricks were used. The doctor was called and gave us things to try to avoid a trip to the ER. He told me what he thought it was given what the PA had seen/said and what he could hear over the phone. It was a LONG night filled with more tossing of cookies, coughing, and worries. This morning TechyDad went to get some Fever All to help with the temperature control. Even better, the little guy is asking for crackers and drinking a good amount of Rite Aid Bubble Gum flavored electrolyte drink. So pardon me, I’m off to take care of my sick little guy and hope we can avoid going to the hospital for whatever is kicking his poor little body. Sending best wishes for a speedy recovery! It’s no fun being sick, and it’s downright scary watching your young child go through this. Hang in there! Poor sweet JSL, cuddle that little sweetie and keep doing what you are doing. We’ll be praying he feels better soon!